Sapphire has officially announced it will be producing Intel-based motherboards for the high-end sector, with the Sapphire Pure Black X58 and P67 Hydra the first examples. Sapphire's decision to offer up enthusiasts mainboards means that it is bringing overclocking features to the Sapphire Pure Black, including the Diamond Black, choked with coolers that feature on the company's well-appreciated top-end graphics cards. "Designed to appeal to the enthusiast, the first product will be a fully featured X58 board, to be known as the SAPPHIRE Pure Black X58, supporting the Intel core i7 series of processors," states Sapphire. 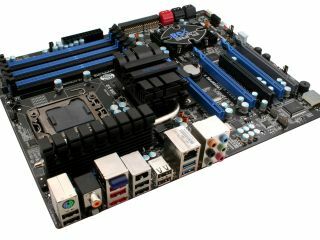 "In addition to the established and highly-regarded X58 chipset, the board incorporates many state of the art features such as on-board USB3.0, SATA III ports in addition to SATA II, Six dual channel DDR3 memory slots and 3 Gen2 (x16/x8/x8) and one Gen1 (x4) PCI-Express expansion slots as well as a host of peripheral connections and on-board 8-channel audio," the company adds. The SapphirePure Black P67 Hydra is broadly similar to its brother, but has been designed to offer a little more flexibility in terms of graphics options. "To be known as the SAPPHIRE Pure Black P67 Hydra, the new board shares many of the features of the X58 model, but in addition to the Intel P67 chipset it uses the Lucid Hydra chip to allow a mix of graphics configurations to be used in its PCI-Express slots," explains Sapphire's release. Both boards are apparently in production, but pricing and a UK release date have not been confirmed.